This post is part of a four part series featured this month on ways you can improve your health and neurological disease. Every Monday in January, we will focus on one of the following topics: sleep, water, exercise and diet. Water is the best drink for your body, but most of us do not get enough. It is recommended that most people drink about 64 ounces of water a day. Another recommendation is to take your weight in pounds, divide by 2 and the result is how much water you should drink daily. For example, if you weight 150 pounds, you should drink 75 ounces of water. Water is also very important for your brain health. Many studies have shown that as dehydration increases, mood, concentration, and overall cognitive performance decreases. Dehydration is a common trigger in patients with migraine. One study found that people who stay hydrated have less severe and less frequent headaches. In people with dementia, dehydration may be more prevalent as the sense of thirst is impaired and they often forget to drink throughout the day. A study found that in people with multiple sclerosis and fatigue, the fatigue was not as severe in people with greater hydration. A common cause of cramps in muscles, especially those that wake you in the middle of the night, is dehydration. Keep water with you all the time. You will not drink it if it is not accessible. 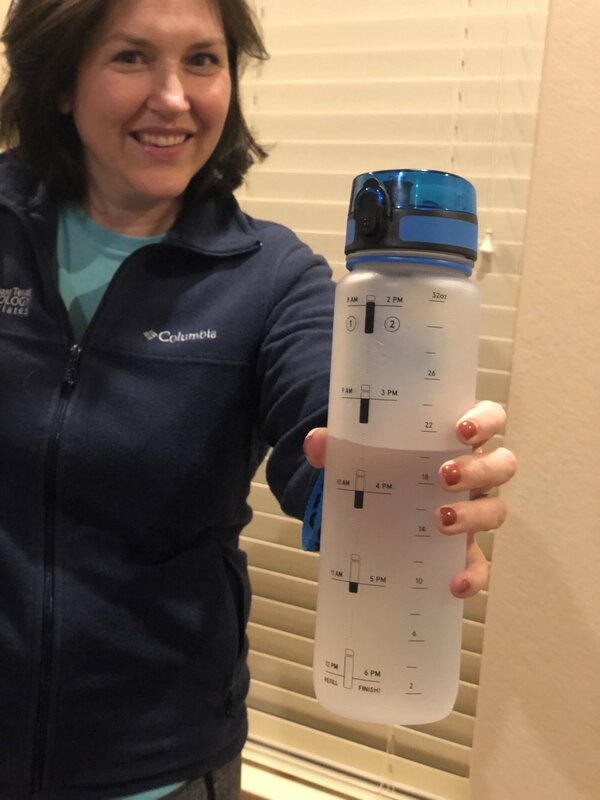 Use a water bottle like this one below (many are found on Amazon), that show you how much water you should be drinking throughout the day. Or you can make your own! Always take water with you when exercising and pre-hydrate at least an hour before any strenuous exercise. If you do not like water, add a berry or cucumber to your water to improve its taste without adding artificial flavors. Your urine is often a good sign of your hydration status. A pale yellow means you are well hydrated. Talk with your doctor about what amount of water is right for you. Some people with kidney or heart disease should limit their water intake.